← FATHERS…one word, express in one hundred words in one hundred days. CONTROL…one word, express in one hundred words in one hundred days. The Law Of Control States That If You Try To Control What You Cannot Control You Will Come Under The Control Of What You Cannot Control. 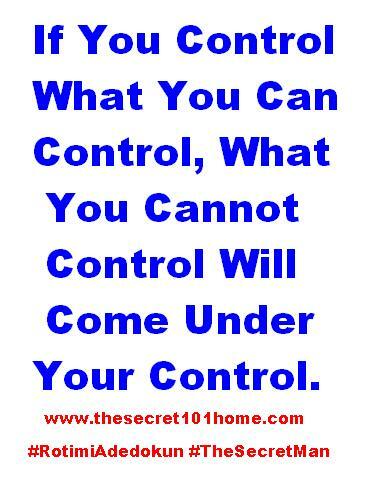 But If You Control What You Can Control, What You Cannot Control Will Come Under Your Control. You Cannot Control Poverty; You Can Be In Charge Of Your Money. You Cannot Determine The Judgment Of Your Boss, You Can Behave Yourself. You Cannot Control Tax And Other Unavoidable Bills; You Can Control How Much You Want To Spend. You Cannot Control What You Earn; You Can Choose To Start Part-Time Business, Make Extra Income. This entry was posted in Life and Time Management, Self Development, The Secret, Vitamin Of The Mind, You! and tagged Be In Charge Of Your Life By Jim Rohn, Control By Bishop David Oyedepo, How To Be In Control Of Life, Jim Rohn, Pasto E A Adeboye On Control, Rotimi Adedokun On Control, Take Charge Of Your Life. Bookmark the permalink.